Before the game, there's the pregame. 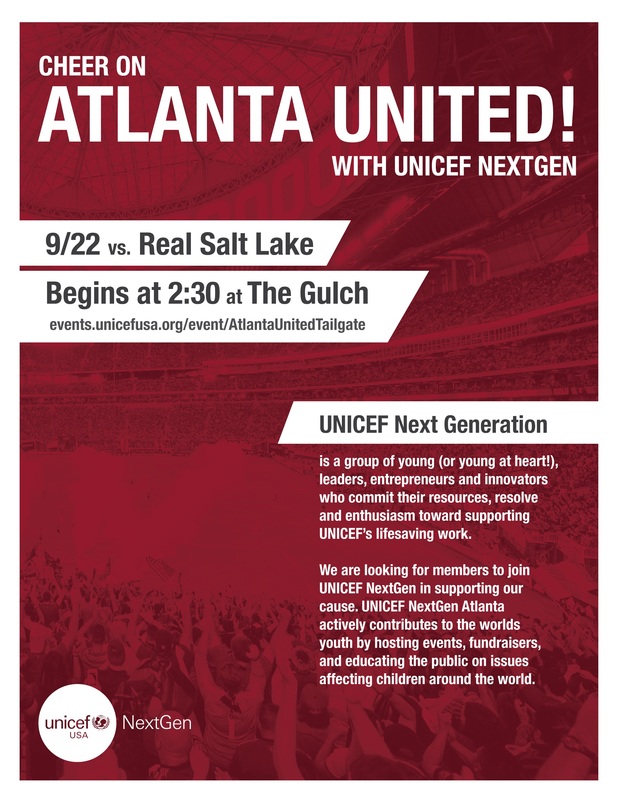 UNICEF Next Generation Atlanta invites you to our Atlanta United vs. Real Salt Lake Tailgating party at Mercedes Benz stadium. Stop by our tent at the Gulch for some hot dogs, drinks, and learn more about the great work UNICEF is doing to help children around the world. And we're looking for new members to join us! Tailgating party is free. Event will run until kickoff. RSVP for the tailgate here: https://events.unicefusa.org/event/AtlantaUnitedTailgate. NextGen ATL also has two blocks of game tickets and there are a limited number available for purchase. If you're interested, shoot us an email at atlnextgen@gmail.com. So come for the United pride. Stay to make an impact on the lives of children around the world and meet some really amazing people. We hope to see you there! UNICEF Next Generation Atlanta is a group of young (and young at heart!) leaders, entrepreneurs, and innovators who commit their resources, resolve, and enthusiasm toward supporting UNICEF's lifesaving work.